Yesterday, Denmark were knocked out of the World Cup leaving Croatia in a quarter-final tie against hosts Russia. Turned up & tuned in: How energy efficient is Birmingham's Town Hall? 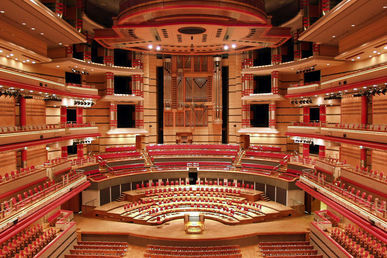 As part of our ongoing partnership with the Energy Check, Town Hall Symphony Hall spent time with the expert THSH Technical team to assess the real world impact of operations at Town Hall, Birmingham. In June, Town Hall Symphony Hall partnered with Black Voices and Ladywood Arts Forum to celebrate the 70th Anniversary of Windrush. Audiences were stunned to find Brian Eno in the audience with them on Saturday night for Sona Jobarteh’s Jazzlines gig. "Supporting the local music scene nurtures the future of music"
Ahead of his performance this Thursday, THSH caught up with 19-year-old singer-songwriter Felix Shepherd to find out his musical inspirations, favourite artist and the first album he ever bought. "Thank you for calling Buckingham Palace"